There are some guys who just play better when the lights are brightest. Deion Sanders had such a knack for making plays in on the biggest stages that he in fact earned the nickname "Primetime." The Dallas Cowboys took the field during the nationally televised Sunday Night Football game last week against the Philadelphia Eagles. The pressure gets to some people, but not the ones that we're here to discuss. These are the biggest moments that earned the biggest roars from the crowd. Welcome to the Plays Of The Week. It's good to have you. Enjoy! 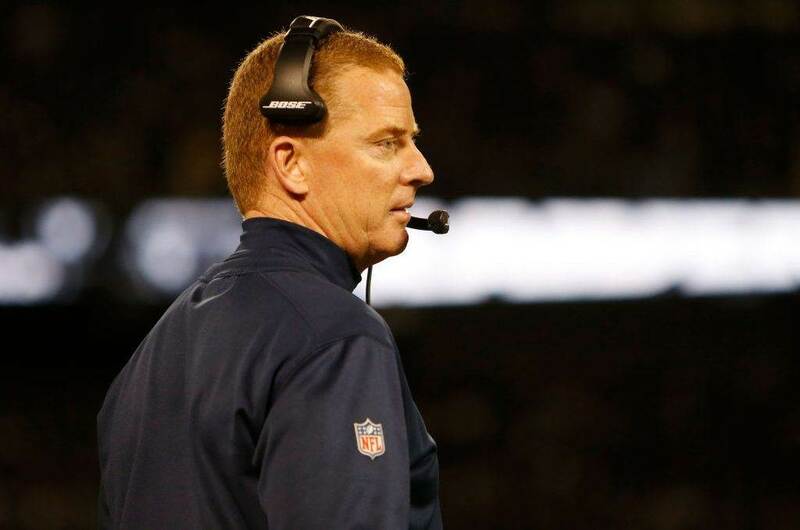 The Dallas Cowboys failed to produce a single touchdown in their Week 8 loss to the Seattle Seahawks. That trend broke midway through the first quarter when Matt Cassel found fan-favorite Cole Beasley for the first points in the game. Cole ran a great loop-type route against Malcolm Jenkins. It's very difficult for defensive backs to match up with Beasley because of his small size. He's so fast and so shifty that this play is nearly unstoppable in short-yardage situations. It was refreshing to see the Cowboys use it to their advantage - something they'd failed to do over the previous five games. There's no doubt that the double team of Dez Bryant helped the play, but give kudos to Cole for getting it across the goal line. With just over two minutes left in the third quarter the Dallas Cowboys hadn't scored any points since Cole Beasley's touchdown way back in the first quarter... then Matt Cassel threw it to Cole again. It was a very simple throw - just about 10 yards. Cassel made one read and then saw Cole with inside space. As he had done on the previous score, Beasley shook Malcolm Jenkins. Cole went in and out, back in, then in and out again. After catching the pass he sprinted through four Philly defenders all the way to the endzone. It was a very familiar play for Cowboys fans as it's the type that we're used to seeing from Beasley. 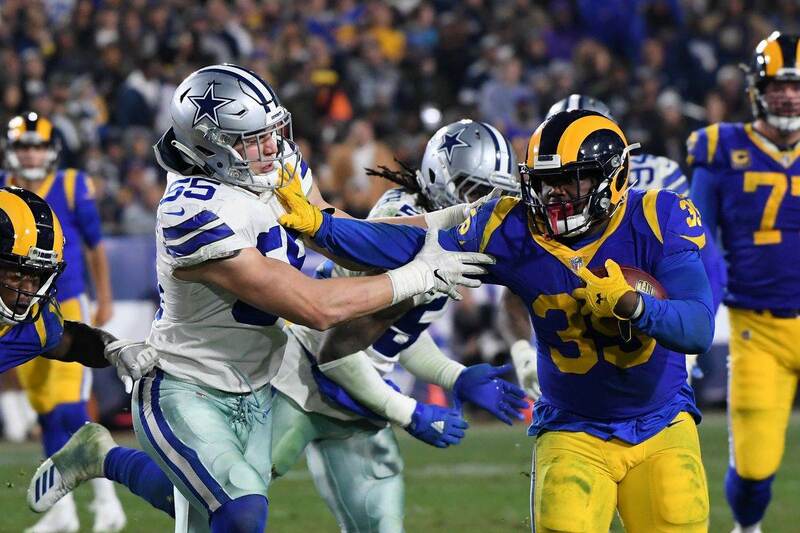 Cole is a fantastic weapon for any quarterback, as he showed in this game, and he's going to be pivotal as the Cowboys look to get things back on track soon. After Cole Beasley tied things up the Cowboys were driving... until Matt Cassel threw a pick six. It seemed to take all of the air out of AT&T Stadium, until Lucky Whitehead re-inflated it. The Cowboys were massively in need of a spark at this point and Luck Whitehead delivered. Lucky fielded the Eagles kickoff in the endzone, dodged some tackles, and sprinted all the way down to the Philadelphia 23-yard line. The Cowboys kept Lucky as an ideal replacement for Dwayne Harris who left for the New York Giants. He's got amazing speed and an incredible ability to stop and start again. It was all on display as he helped set up the play of game for the Cowboys. This is one of the greatest plays that I have ever seen. Let's start at the beginning. This is a pivotal point in the game. After just surrendering a touchdown and getting a big return - it would have been disappointing to come away with only a field goal. Cassel needed to make a play. Matt Cassel gets a brief look at everything before he starts to sense the pressure coming from Tyron Smith's side. He has to figure out what to do very quickly. He knows that Tyron Smith is going to buy him a second, maybe two, but that's it. There is still nothing open downfield and considering that this is third down there is no second chance. Something has to happen now and it has to happen fast. Cassel rolls right in an effort to buy more time. Tyron finishes his block so he knows that he's clear back on the left side. Now he's in a new pickle. Doug Free is about to lose his block. The right side, the safe side, is about to become compromised! What to do next?! Matt Cassel then decides to roll BACK TO THE LEFT SIDE... which is now safe and sound. His vision is now 180 degrees away from where it's supposed to be. The objective at this point is just to buy time and figure things out as he goes along. He knows that he's got receivers downfield by now, but he's going to have to make a decision in a matter of seconds. If he's going to throw he knows that he has to set his feet because he's running to his left and a throw across his body is a big no-no. Then a glimmer of hope appears! Dez Bryant is there! "I can throw it to him!" Cassel is thinking. He does what every quarterback is taught to do... set those footsies. This is it. Throw it and pray. Let Dez go be Dez. You've done what you can, Matt. Now let that ball fly! It is at this moment that the collective breaths of Cowboys Nation were being held. We are a fraction of a second away from what is arguably the most impressive play of the season - save for Tony Romo's game-clinching touchdown back in Week 1 on this same field. Terrance Williams is almost the literal version of us as he is staring up hopefully as the one-of-a-kind Dez Bryant looks to make a spectacular play. "Is this possible? Is it really going to happen? I can't take it anymore! Show me!" Dez Bryant is a monster. He simply wants it more than anyone else around him. He is unquestionably the most talented player on the field and he goes up and gets it. There is no other way to put it. I know that we were Terrance before, but now we are all Lucky Whitehead. Completely off of our feet staring up at the wonder that is Dez Bryant. "When are we landing? Is this going to hurt? Are you about to crush me, Dez?". 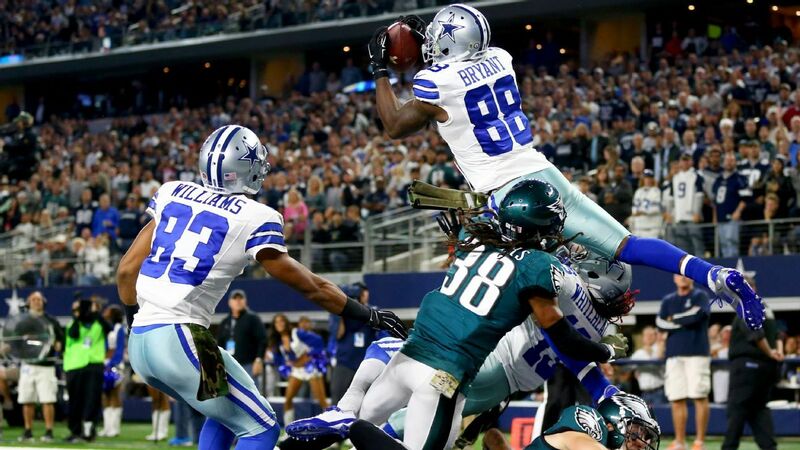 This is one of Dez Bryant's finer pieces of work and he gave it an appropriate celebration. Congratulations on your first score of the season, Dez. We can't wait for the ones that are on the way. What do you think were the biggest plays from Sunday Night? Email me your thoughts at Roel.Ochoa.Jr@Gmail.com or Tweet to me @rjochoa! 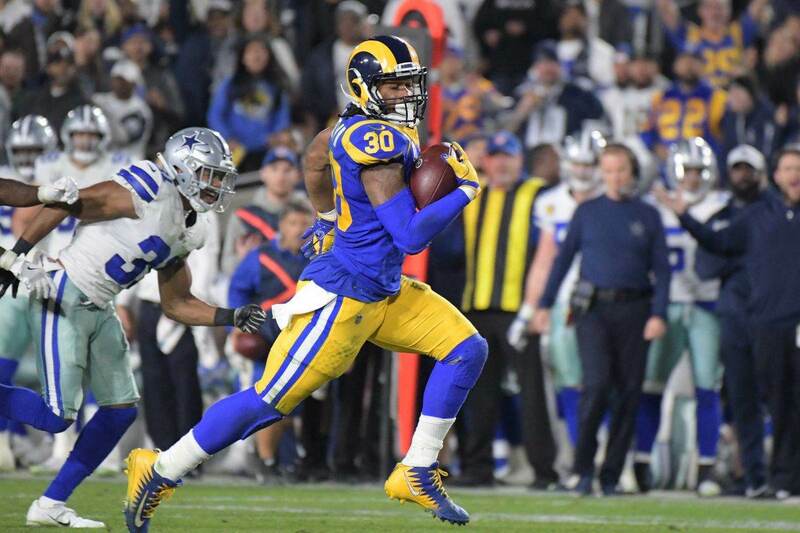 Tell us what you think about "Dallas Cowboys Big Time Plays From Week 9" in the comments below. You can also email me at RJ.Ochoa@SlantSports.com, or Tweet to me at @RJOchoa!